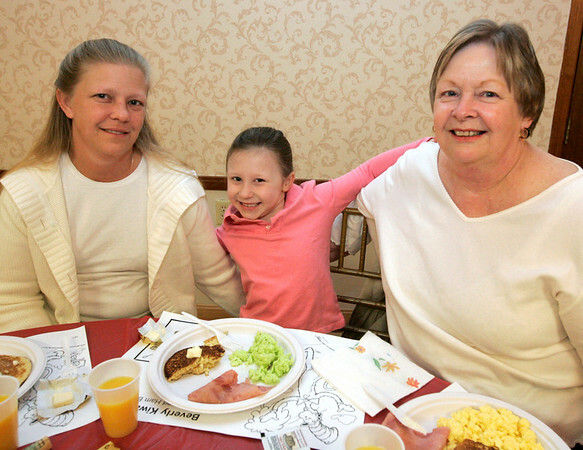 Beverly: From left, Rebecca Keener and her daughter Cheyanne Russell of Beverly along with Sandy Gray of Peabody enjoy a serving of green eggs and ham along with pancakes while the Italian Community Center Saturday morning. The Kiwanis Club held a breakfast, complete with characters and free books, to celebrate Dr. Seuss' 105th birthday. Photo by Deborah Parker/Salem News Saturday, March 21, 2009.